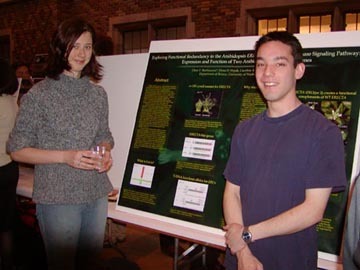 Mauna and Kylee in front of Mauna's poster "Meristemoid Gene expression in Arabidopsis Cell Development"
Ben and Mauna gave poster presentations at the annual University of Washington Undergraduate Research Symposium. Great job, both of you!! 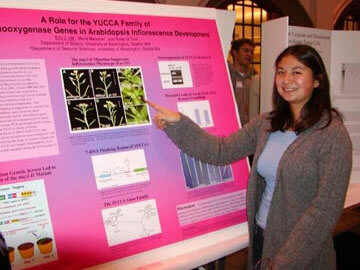 Keiko received the Undergrad Mentor Award. Thanks for the nomination. 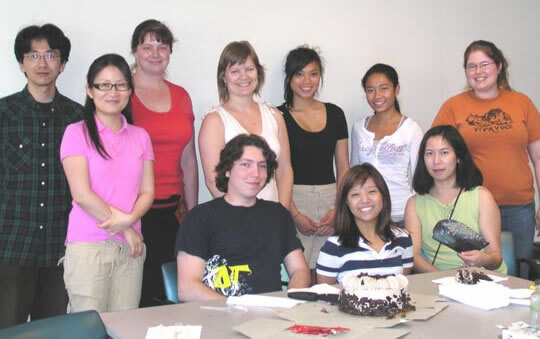 Happy Birthday, Kylee, Rebecca and JinSuk! Happy Birthday, Ben and Natalie! 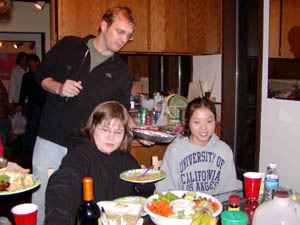 Ben and Natalie, our mighty undergrads, have a joint-birthday-party (a.k.a. Lab meeting). 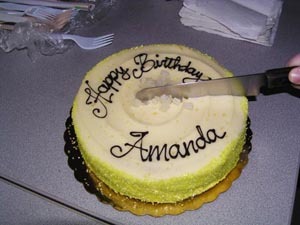 Are we always cutting cakes? Yes, we are always celebrating, especially in the beautiful Seattle summer weather. 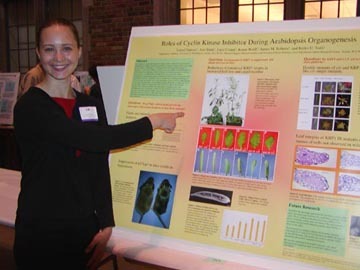 Marie gave a poster presentation at the annual University of Washington Undergraduate Research Symposium. Great job, Marie! And, congratulations for graduation!! 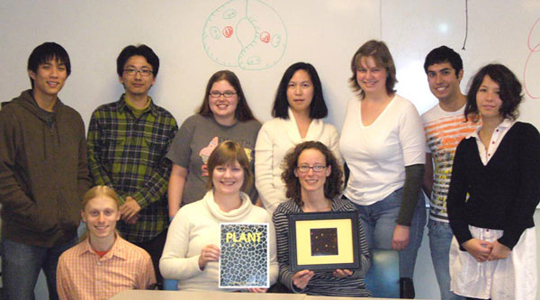 Lynn's last Lab meeting; presenting the artistic photos of scrm-D mute (yes! The cover of THE PLANT CELL) and MUTEpromoter::MUTE-GFP. 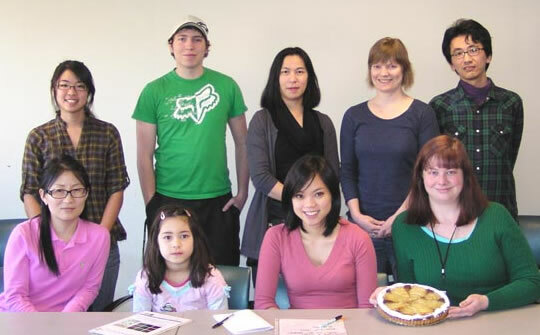 Congratulations, Lynn, and good luck as a Professor at Western Washington! 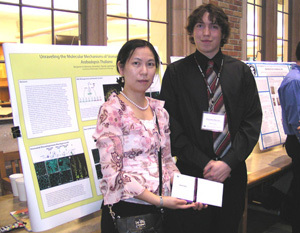 Dr. Takeshi Kuroha (left), our prospective postdoc candidate visit. 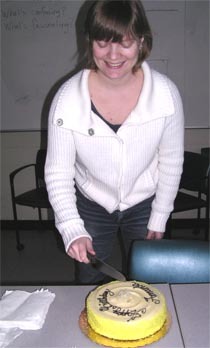 A lot to celebrate for our amazing postdoc, Lynn. Having three offers as an Assistant Professor, another two exciting manuscripts (about to be) published, and expecting a baby girl. What else would you imagine? Happy Birthday Lynn, and good luck with everything! 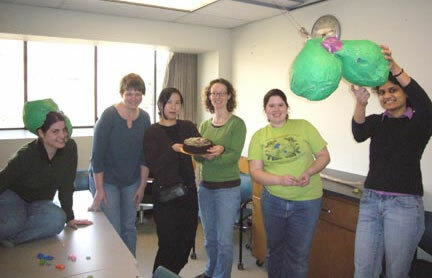 The Hemlock Pinata was hand made by Ali for celebrating the St. Patrick Day. --- Update on June 2008: Congratulations for your baby girl, Lynn! 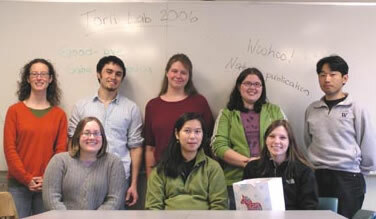 A lot to celebrate for the Torii lab members in this holiday season...Lynn and Naomi have NATURE paper accepted, Shannon's paper is under revision in DEVELOPMENTAL BIOLOGY, Kylee awarded a Mary Gates Undergrad Research Internship, Gabe awarded a Howard Hughes Undergrad Research Internship , Jessica is soon to graduate, and Keiko is expecting a baby girl! 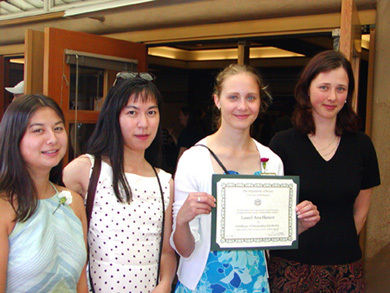 Keiko received the 2006 Prize from The Soceity of Japanese Women Scientists. Photo at the award reception. 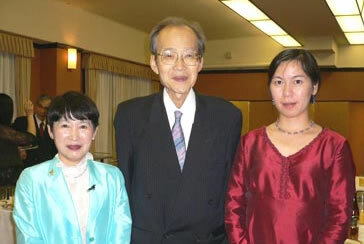 from left, Prof. Hamanaka (Award committee chair), Prof. Sakamoto (a recipient of the life-term contribution award), and Keiko (photo, courtesy of Prof. Hamanaka). 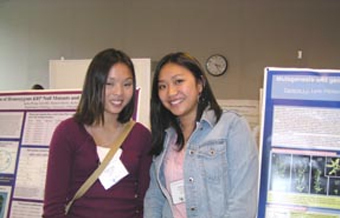 Jamie and Darlene gave poster presentations at the 8th Annual UW Undergraduate Research Symposium. Good job! 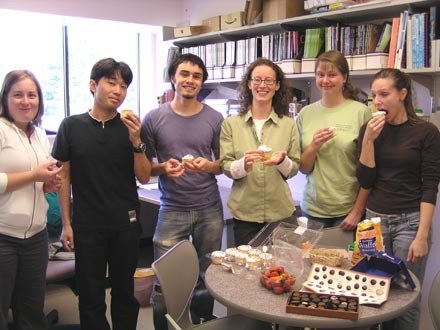 The Torii Lab acquired extra lab space (Yes, Keiko's lab is getting bigger), but it did NOT come with any renovation money!!! 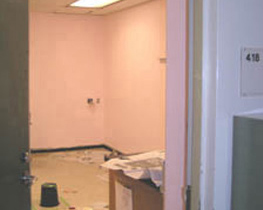 Thank you so much for our mighty tech Shannon , who renovated and painted the whole lab PINK!! 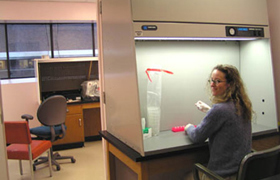 We also thank Lynn and Robert Goff for their enormous help during our "do-it-for-ourselves lab renovation!! Robert built a beutiful lab bench from salvaged materials!!! Lynn is sterilizing her seeds in our brand-new hood! You can see the lab bench built by Robert. 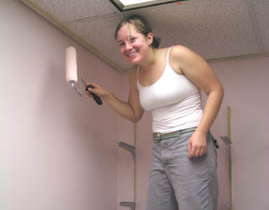 Look how Shannon is painting the entire wall PINK!!! 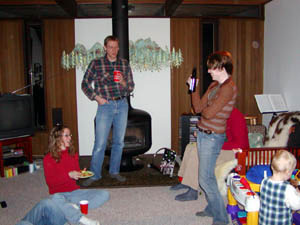 A farewell party for Chris, who just graduated from the University of Washington! Chris earned B.Sci. 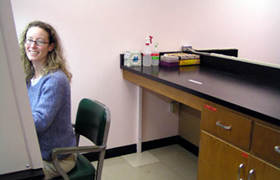 in Cell and Molecular Biology. Congratulations! 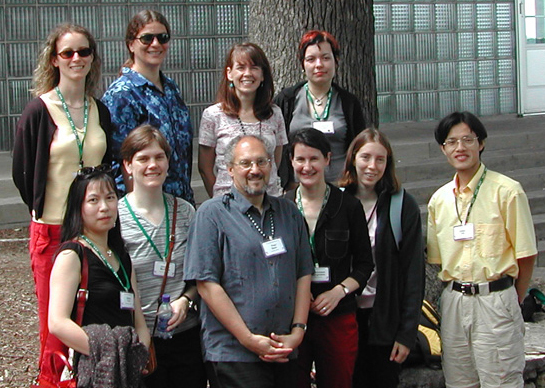 Where are the Torii lab folks? 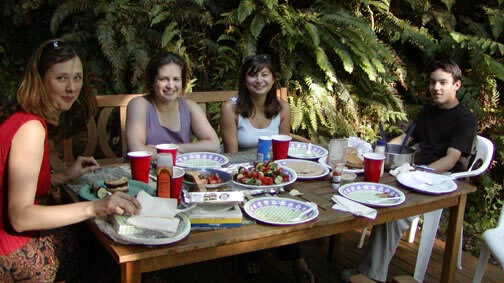 They are at Keiko's place, she lives in the midst of a Pacific Northwest rain forest. Emi and Laurel graduated from the University of Washington! Emi earned B.Sci. 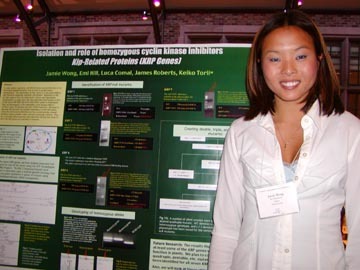 in Cell and Molecular Biology, and Laurel earned B.Sci. in Botany. Congratulations for both! 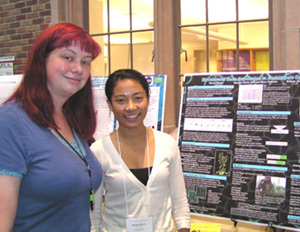 Chris, Emi and Laurel presented posters at the Annual Undergrads Research Symposium. 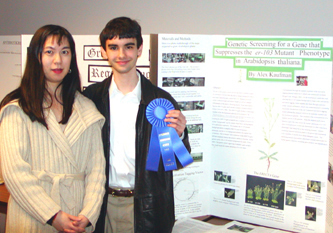 Alex won the First Prize for research competition at the Student Biotech Expo 2002 presented by Washington Biotechnology Foundation (Sponsored by Immunex, Fred Hutch, Zymogenetics, University of Washington, etc). 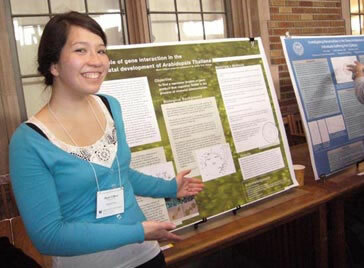 Under the direction of Emi, Alex conducted activation-tagging screen to identify novel loci whose overexpression suppress the inflorescence defects caused by erecta mutation. Great job, Alex! !